Before I get to the nitty gritty, I want to thank you all for your support on the first tournament fight! Rexy prowled through the forest, finding a dead hadrosaur. But the Buck T. rex was also there, eating the dead herbivore. Rexy roared, getting his attention. He thought she would accept him as her mate because of the kill, but no. Rexy was hungry and not in the mood for sharing a kill. She tried to drive him off, but the Buck T. rex refused to back down. The young and inexperienced buck charged, but his opponent dodged. She bit his neck, slamming him into a tree. The male shook her off and the two jawlocked. Rexy clamped down on his arm and pulled, ripping it off. He screeched in pain, chomping down on Rexy's head. She shook him off, her jaws smashing into his skull. One of her teeth took out his eye, then Rexy headbutted her enemy, knocking him over. The buck kicked her away and stood up. Rexy lunged at him, chomping down on his leg. The buck roared and bit her back. She pressed harder, making him release his grip. The buck panted, too injured to keep fighting. He forfeited, giving Rexy a feeling of victory. But then, something changed in her heart. What had once been hate and anger towards this creature was now pity and sympathy. The fight made her lose her appetite, and she ran over to the male. Rexy let him eat with her. The two were now a pair mated for life. I always thought it would be great if Rexy had a mate, which explains the ending plot twist. 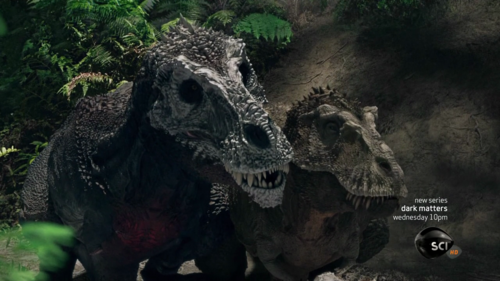 The next fight will be the JP3 Raptor Pack Vs. the T. rex pair from TLW! Nice work. Actually a pretty plausible battle situation too. Well done and I like the ending. Rooting for the Rex pair next time around. Ok, the story seemed too short for my liking, but I'll overlook that. Same with the amount of detail, but again I'll overlook it, because you are starting out with this type of writing. What I find very weird is why after a brutal, hanger-induced (no, I did not mispell it) fight, would Rexy suddenly accept a sub-adult male as her lifelong mate? Yes, you said that this male made a kill, and he thought that Rexy would decide to make a pair-bond with him. Does this mean your "Buck" actually knew Rexy was in the area, wanted to mate with her, and made a kill in a plan to seduce her? It was very unclear, and never mentioned before hand. Normally courting would go beyond just presenting a potential mate with food. A display would have to happen, because this male should want to have to do everything in his power to seduce her, and not show a half-effort. Besides, you also said that "Buck" is a JUVENILE! As in, not fully-grown! So why would Rexy even consider "Buck" to be a potential mate at that time? I would have left it more open, with Rexy taking him under her wing, as if she was a big sister, but "Buck" hoping that one day she would become his mate. It's a rookie story, no big deal, but it didn't blow me away. @JPAlphaRex65 Buck is not a juvenile; he is a fully grown adult. If your suggesting Junior who is juvenile would be too freaking youg and small to be Rexy's mate. Also i dislike how you always assume the Tyrannosaurus isn't very smart! Among the giant theropods sans hybrid Indominus rex and future tyrannosaurid Vastasaurus, Tyrannosaurus is the smartest! Bull is the name of the toy verison of Buck, Buck is the movie verison of Bull. "All I wanted to do is hunt the Tyrannosaur, a BUCK, a male only" Roland Tembo. @Something Real: Thanks! Now there are two T. rex pairs! Did anyone notice I changed my name? It has been a while SR, nice to see you too. Yeah JPSpinoRex, I noticed. Threw me off at first because I didn't recognize the screen name. Nice to hear from you too SOMETHING REAL! @Lord Vader: how many Raptors are in the JP3 pack?